Russia was definitely a different place back then, and a lot have changed! All my pictures from Moscow, Russia are on Flickr. So, I was a bit surprised to go through a lot of problems getting a visa. It was a mix of needing a business visa since it was a trip covered by Mozilla insurance and just general administration. I also have to say that the organizer in charge, Alexander Kozlov, was really good! No matter the time, or the problem, you could e-mail him any time of the day and get help. He took very well of the speakers, and constantly made sure that we had everything we needed. 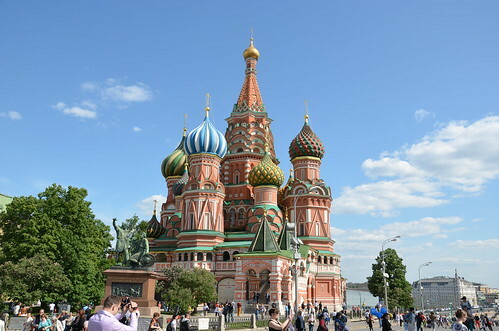 When arriving in Moscow, it took about ten minutes to go through customs. They looked at the visa, stamped it and that was it. When leaving Moscow traveling home the security had one rule: Do NOT take off your shoes! The conference was a one-day, one-track affair with 300 attendees, with about half from Moscow and half from far away places in Russia (such as Novosibirsk, in Siberia!) and also many from Ukraine. There were four international speakers at location, and two over a live stream. They also had three local speakers. The venue was a good one, Digital October, where President Dmitry Medvedev held some press conferences as well. Technically everything seemed to work well, and the slides were projected on multiple plasma screens on both sides of the stage. There were a few talks before mine, I was the last talk before lunch (at 15.00!). 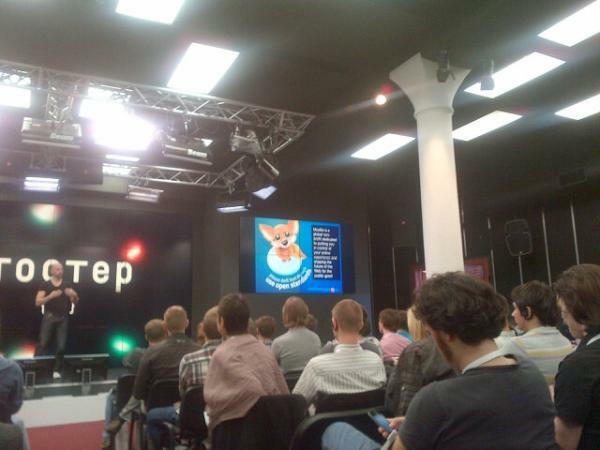 Seeing the feedback the other speakers got on Twitter following the #toster_ru hash tag, it was vicious! We had heard that Russians can often try and ask very hard questions, but in this case it all went to Twitter instead. There were a good amount of comments about how boring they found some talks, “write more, do less” about the code examples, saying they should ask for refunds etc. My slides are available on SlideShare. I also demoed a Boot to Gecko phone to a number of people and they were quite excited about it! It was all ok, though, for people not drinking. I met a Russian who didn’t drink at all, and I believe there were more than him. I and the other speakers were posing for tons of pictures with different people, signing autographs and such. It’s just small things that happen, but what I believe it comes down to is the attendees showing their appreciation that we took the time to visit their region and talk to them. Something that’s vastly important and should never be underestimated. Sounds like good fun! Indeed we live in another world now than roughly 20 years ago.. Thx for sharing, man.